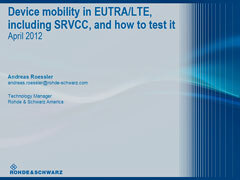 Mobility is an essential part of LTE technology due to LTE’s initial hotspot deployment. This webinar will provide insight into mobility procedures in LTE and relevant measurement events. It will also explain aspects of handovers from LTE to 3G or 2G with an active IP multimedia subsystem (IMS)-based voice call (voice over LTE, VoLTE) known as single radio voice call continuity (SRVCC).